Evelyne Schulz (aka eleathyra) uses GIMP to conjure images from a realm of magic and fantasy — that then may end up on the cover of books. Tom Carlos uses Inkscape to create dreamy Californian and 80s-style portraits. David Revoy uses Krita to produce the increasingly popular Pepper&Carrot webcomic. They all graciously agreed to talk to me over IRC and lend their art and videos to help illustrate this piece. Today we are talking to David Revoy, creator of Pepper&Carrot and Krita ambassador and evangelist. Paul Brown: So… Why do you use Krita over a more… er… let’s say “popular” software like Photoshop? David Revoy: I was a Photoshop and Corel Painter teacher and user from around 1999 to 2009. But at one point I got burnt by a Windows Vista update. All the proprietary software I owned (Photoshop, Painter, etc.) required I buy upgrade packs. It was an investment of a full month’s salary only for a compatibility update, without any additional features. David Revoy: Back in 2009, digital painting on Linux and free software in general was almost non-existent. So I decided to get involved with a couple of projects I found. They were MyPaint and a Japanese fork of GIMP named Gimp-painter. I started to do my digital painting work this way, with few features. Then I got hired by the Blender Foundation to do the art direction of the open movie Sintel. David gave Sintel it’s distinctive look. Paul Brown: Ah, yes! Sintel. I can see the resemblance with Pepper & Carrot. David Revoy: I did all the work with open source. I started to do lot of advocacy work in favour of GNU/Linux painting, and that’s how I met the Krita team. Nowadays Krita is amazing :). Paul Brown: What did you use on Sintel? 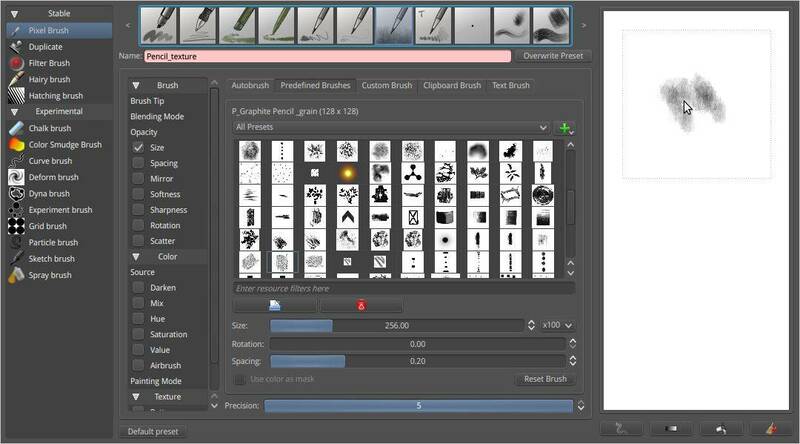 David Revoy: Gimp and Mypaint. At around 2009/2010, Krita wasn’t really usable. The team decided to adapt it to digital painting round about that time. Before that Krita was a general image editing app. They obtained some money from a crowdfunding and were able to hire a developer to do the job. We worked together and, in 2012, I moved all my work and started using Krita exclusively. Paul Brown: You say Krita was unusable back then… And now? David Revoy: Nowadays Krita is amazing :). Paul Brown: Just to continue down memory lane a bit more, I read you once had to pay $800 just for one feature on a proprietary app. What was that all about? David Revoy: It was Photoshop and Corel-Painter. I had to update the pack so it was stable on Windows Vista. The price was like 300€ for one, 150€ for the other, but I also had to update Manga Studio, the Sony Vegas video editor, and many apps in the same situation. I was the owner of a windows XP pro license and I thought I could just buy a computer and install this OS and all my software on to it. Unfortunately, in 2009 I bought a machine with a motherboard only compatible with Vista drivers. So, I *had* to upgrade everything to Vista. That was a really bad week: a had to spend a lot of money and my productivity was totally ruined. A lot of artist laughed at my Free Software set up. Paul Brown: Why do you think other artists put up with this kind of thing? David Revoy: I guess they think they don’t have choice. David Revoy: I was always against piracy, but I guess a lot of people don’t think the same. 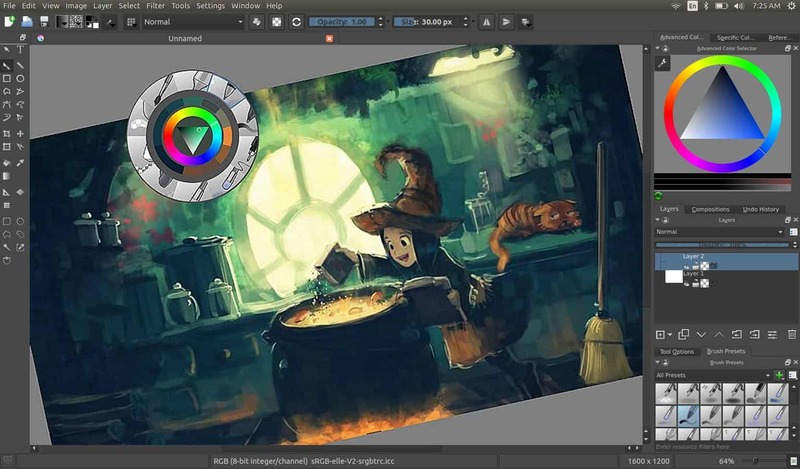 David uses Krita running on GNU/Linux to design Pepper&Carrot. 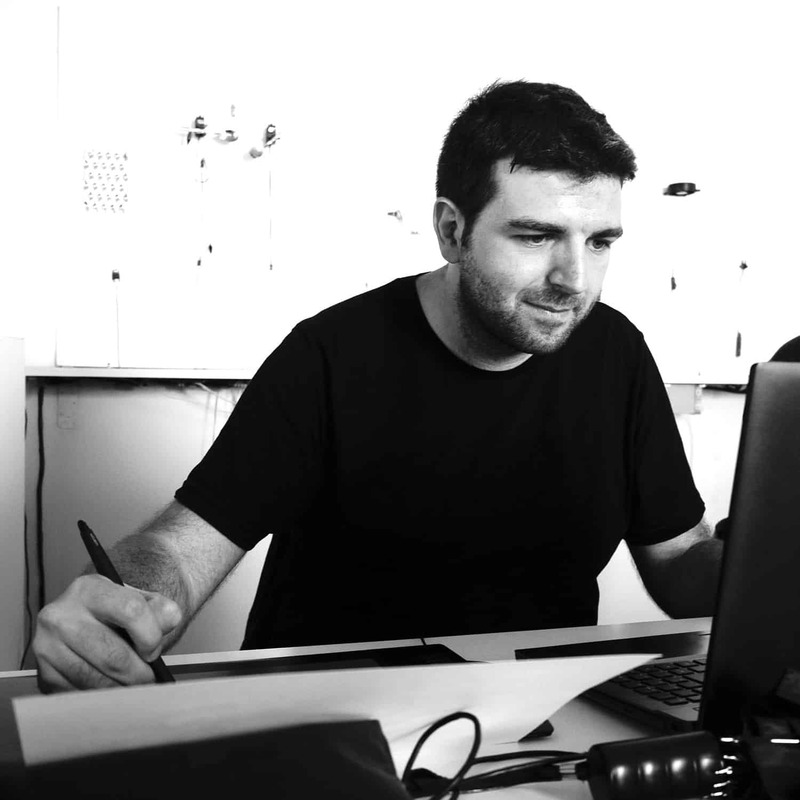 Paul Brown: Talking of fellow artists… How do they see your use of a Free Software tool for your work? Are they surprised? David Revoy: At first, a lot of them laughed at my set up. Paul Brown: Really? It would seem that the joke is on them, what with the expensive licenses, forced costly updates, and so on. David Revoy: Well, the features and the way the [Free] software was designed were not professional at all back then. Paul Brown: Do they still think the same now? David Revoy: No! And Krita is installed on every computer I see. Even if it’s not the primary tool (not yet), it’s installed and a lot of artists keep an eye on it. Back in 2009 I did my first public demo video. It was the proof of concept made with Gimp and Mypaint. Paul Brown: Have you converted a lot of your colleagues yourself? David Revoy: Not colleagues, but my energy and demo converted and invited a lot of Internet users to try to do the same thing. I have also published a lot of tutorials and made two DVDs with the Blender Foundation. Back then digital painting on GNU/Linux had more developers than users and beta-testers. Paul Brown: I must say I love your speed-painting videos. David Revoy: Thank you :). Paul Brown: Is this still true, though? That there are more developers than users, or have things changed? David Revoy: It totally changed after the Krita developers made a Windows version. Paul Brown: But you use Krita on Linux, right? David Revoy: Yes, I’m a Linux user since 2009. David Revoy: Each episode of Pepper&Carrot is a little miracle. I mean, the production is always challenging. I’m really proud of the Pepper&Carrot community. There are more than 30 translators and I get a lot of help. There are also all the derivative projects. Paul Brown: And apart from Pepper & Carrot, are you working on other projects? David Revoy: I wish I could. I still end each month with sleepless night for the release of the Pepper&Carrot episode. My secret project is to make more YouTube tutorials, one per week. Paul Brown: What are some changes you would like to see included into Krita? Krita is currently very feature-complete. Paul Brown: There must be something you miss or that annoys you. David Revoy: Maybe a better text tool and vector tools, but the team is running a crowdfunding campaign for that right now. Paul Brown: How can readers support your work? Do you have a donation page, shop, or something like that? David Revoy: I use Patreon. My supporters have their names written on the credit of Pepper&Carrot. I also have a PayPal button at the end of each webcomic. That’s how I make a living right now. I stopped doing freelance work last autumn. Paul Brown: Really? This is your day job? David Revoy: Yes, it’s still a bit ‘short’ but every day it gets better and better. Paul Brown: “Pepper & Carrot” is distributed under a free license, right? I’ll never regret making Pepper&Carrot so open. Paul Brown: Even scans of the pencil sketches, yes. David Revoy: Haha, yes. Today a university in Japan got in touch to run something past me, a research paper. It makes me happy to see Pepper&Carrot artwork used for science. Paul Brown: From what I can see, they turn scans of sketches into vector art? David Revoy: Yes. Pepper&Carrot artwork is used on many little projects. There is also this game. Check out the commit for sprites made today. All of this is the really exciting part of working on an open-source project. I’ll never regret making Pepper&Carrot so open. A Pepper&Carrot-inspired video game is coming soon. Paul Brown: Have you considered offering the developers your help? David Revoy: They contacted me for the game, but I told them I didn’t have a lot of time. They ping me in private emails asking me questions about the universe from time to time. That’s all I can do. 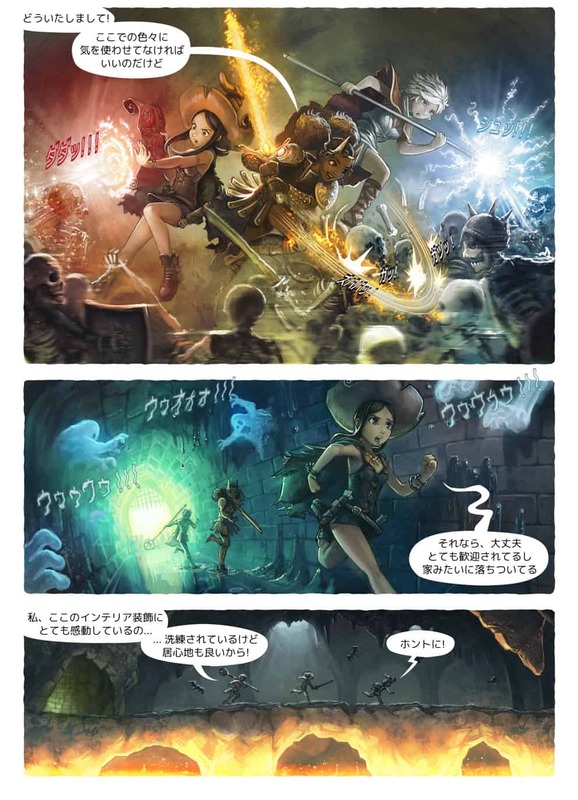 The webcomic itself and the translation system is still a massive amount of work. Paul Brown: Wait… What? You have a render farm for what now? David Revoy: For rendering the pages of Pepper&Carrot. Nothing existed to render a multi-language comic, so I invented something. I have 16 git repositories and each repo is an episode, with 20 or 30 languages. Each episode is around six to eight pages long. Paul Brown: And you have a render farm to create the episodes in each language? David Revoy: Yes, it finds the changes on the git server, and re-renders the pages with the changes. 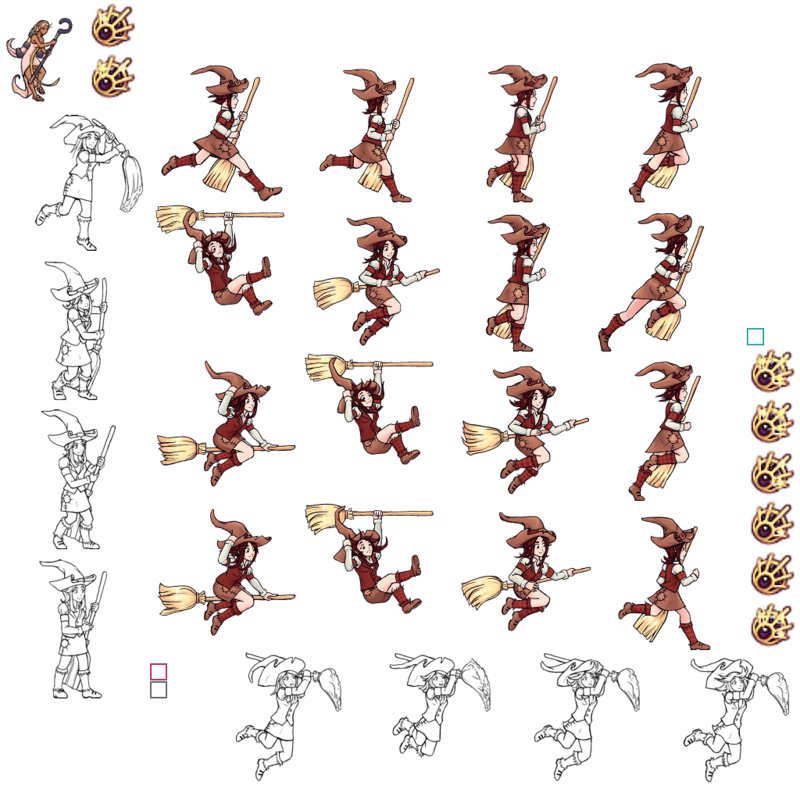 So, I can change the graphics, and every translator can work on the translations independently. That’s how new episodes of Pepper&Carrot are translated before the release. Pepper&Carrot is translated by a community of fans. Paul Brown: That is very clever. David Revoy: Thank you. I have this big big machine, but everything is available on GitHub. 7,033 SVG files. Each SVG file is a translated page. I use SVG for the speechbubbles and text. The artwork is a Krita file. Then ImageMagick glues them together on the renderfarm. So Inkscape is the secondary tool on Pepper&Carrot. All the translators use it, as well as git. The render farm renders a version for print and a version for web. Each version is a page glued together. The farm provides many other services. Paul Brown: That is impressive. Do you have any more surprises up your sleeve? David Revoy: I have. Unfortunately I can’t tell you much about it at the moment. I can only say that big industry are starting to take an interest in Pepper&Carrot. I expect many changes next year. Paul Brown: Uh oh! A movie… or a TV series! Can we publish that? David Revoy: But I didn’t say anything! Paul Brown: Just in case any lawyers are reading this, we can confirm David didn’t say anything. We guessed it all by ourselves. David Revoy: xD. It’ll be interesting to see how a Creative Commons license works on a derivative product on an industrial scale. Paul Brown: This is huge, David. Congratulations. Thank you for your time… and the exclusive! David Revoy: Thank you for letting your readers know about Pepper&Carrot, Krita and my work in open source. 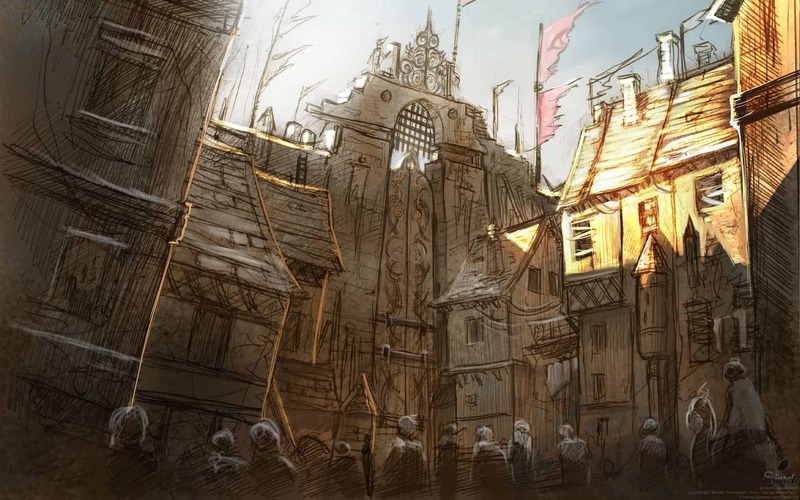 Now read the second part of this series in which we talk with Evelyne Schulz, painter of fantastic realms, about GIMP.